The rules and dates for this event are listed in the sidebar. Below the photo of my tag I have listed the techniques and products that I've used. If you want more information, please email me using the email contact form in the sidebar. BozenA's tag information and how to's are listed on her blog (link provided). Click HERE to be forwarded to BozenA's blog post. There you will find out how she made this amazing tag! Lots of inspiration! Click to take a look of all the tags from me, my Guest Designers, and participants. Check out the boards for TTofC 2014, 2015 & 2016 as well! Come join the fun! 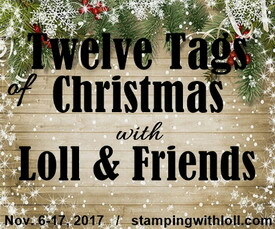 Enter your Mixed Media Christmas Tag in the linky below. Wow...Stunning Alcohol Ink smooshed background for your gold foil die cut deer, Loll! I love the brown and gold tones for your background. They really blend beautifully with your elegant deer. TFS my friend. WOW <Loll !! Your tag is the essence of beauty and elegance. I love beautiful brown-gold AI background. Amazing, so beautifully highlights the golden silhouette of the deer. Great tag in every millimeter. I am so grateful for the distinction I received that I was able to attend your event. Thank you for this incredible honor my Friend. Lovely tags! 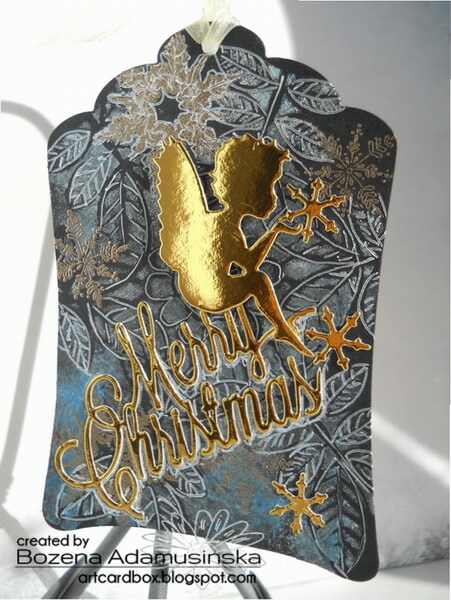 The reindeer and angel dies are both gorgeous! Wow! what a background you have here Loll. Perfect for that regal deer in gold. Amazing and beautiful tag by BozenA. Her backround is a stunner also. Loving the gold in today's tags. What a gorgeous reindeer, Loll! He looks so dapper against the beautiful alcohol ink background! Wonderful rich colours, Loll - perfect background for the gorgeous gold reindeer. Great pairing of your tag and BozenA's tag! This one has a definite WOW factor and is my favorite of all your wonderful tags so far. That background is something else- a look I tried for but never quite got it. The rich contrast of the browns and white make this one spectacular! These are totally amazing. I love the gold images. And your background is jaw dropping. Loll, you tag is fantastic....that AI background is brilliant, took my breath away...WOW!! wow...more inspiration and gorgeous eye candy!! Thanks so much ladies. WOW! Your background is absolutely stunning, Loll! 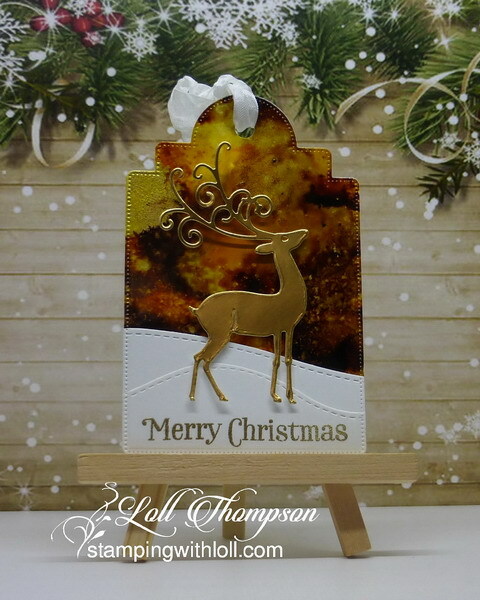 What a stunning way to showcase this lovely gold reindeer...I really love this tag! That stag looks like he's mighty proud to be standing in front of that incredible sky, Loll.